Find out everything you need to know on the new Lexus Ls from independent vehicle review website Car And Driving. You can watch the video review to the left to see more of the car or read their written review below to get a true insight from an expert in the automotive industry. The Lexus LS460 isn't going to make big sales but it's hard not to be impressed. Jonathan Crouch drives the most affordable 'Luxury' version. The revised fourth generation Lexus LS looks a strong package and in LS460 guise, it's a good deal more affordable and wieldy than the giant long-wheelbase LS600h variant. Here we look at the most affordable Luxury version which lacks the sporty additions of the 'F Sport' version but will probably suit most typical LS buyers better. Big petrol-engined models are never going to be big sellers over here but make no mistake - this is a good 'un. Are we really four generations removed from that first Lexus LS that caused such a tectonic shift in the luxury car market back in 1990? It seems we are. Much has changed since then but in the aggressive shape of the latest Lexus LS460, we have the car that's the truest lineal descendant of that ground breaking LS400. Back then every nut, bolt and grommet was new and this MK5 model too, is pretty fundamentally different, with almost every body panel bar the doors, roof and rear three quarter panels completely new. That said, this car does ride on the same chassis as before, leading some, rather churlishly, to think of it as a series four and a half model. But that's unfair. Lexus have made so many changes, with some 3,000 different parts, that this is anything but half a job. What's more, this generation Lexus has changed its philosophy probably more radically than any before. Whereas once, an LS was all about syrupy smoothness and refinement, that is no longer enough. The latest version of this car has attitude and is much more fun to drive, even in entry-level Luxury form. Let's try it. The LS460 is powered by a 4.6-litre 382bhp V8 and you've got 493Nm at your disposal so it never feels particularly strained. Drive is directed to the rear wheels via an eight-speed transmission and it's all enough to get you from standstill to 62mph in just 5.7 seconds. The electric power steering has been retuned, the body rigidity improved and a special four-wheel interlock system for the dampers has improved body control. You can already see from this that Lexus knows that this car must handle a lot better than it did previously. Which is why even though this LS460 Luxury model lacks the lowered suspension and a torque-sensing limited slip differential of its identically-engined F Sport stablemate, it still gets 'Drive Mode Select'. Borrowed from the smaller GS saloon, this system allows the driver to alter steering, throttle and suspension response through five switchable driving settings - 'Eco', 'Comfort', 'Normal', 'Sport S' and 'Sport S+'. The sporty two come accompanied with a red instrumentation glow and allow you to fully appreciate the efforts of the engineers in sharpening the steering feel and reducing bodyroll through the corners by making the air suspension co-operate more closely with an AVS Adaptive Variable Suspension set-up that gradually increases damping force as speeds rise to give low speed comfort and high speed driveability and stability. Park the fourth and fifth generation cars side by side and while the basics are vaguely similar, all of the detailing looks different. It's a bit like those advertisements in fitness magazines with a before and after picture. The MK5 model car looks gym-honed and far better defined. The front end is dominated by the spindle grille which then leads the eye to an aggressive under bumper air intake. You'd scuttle out of the way of this car if it homed in on your rear view. The F Sport looks even meaner with a mesh front grille, front and lower rear bumper mouldings, 19-inch wheels and F Sport badging. The interior of the LS460 is beautifully built but the ergonomics and aesthetics of the minor controls are a long way off the class best. Some of the attention to detail is just astonishing though. The Shimamoku striped-wood steering wheel that takes 38 days to produce and involves 67 manufacturing steps is a case in point. Space in both the front and back of the standard wheelbase car is more than acceptable and the boot is a cavernous 560-litres. The Lexus LS has always been a hard car to objectively assess from a value per money perspective. That's because it very much depends on your mindset. There are those who see this as the world's best engineered car and deem that it represents a significant bargain. Then there is another school of thought that holds that the LS doesn't have anything like the inherent style of its European rivals and represents a lot of money for an overgrown Camry. The truth probably lies somewhere between. While Audi aren't going to be frantically cribbing the LS interior aesthetics, I can see a few disgruntled engineers in Germany when they perform a strip-down of this latest Lexus. The LS460 is available in two trims, Luxury and F Sport, the Luxury model we're looking at here priced at around £72,000, so offering a £2,500 saving on the F Sport. Despite that, buyers get a complete kit tally including 18-inch alloy wheels, automatic bi-xenon headlamps, and LED daytime running lights. Cabin comfort is assured with leather upholstery, four zone climate control, and air conditioned electrically adjustable front seats (16-way for driver and 14-way for front passengers). On-board entertainment is provided by a 19-speaker Mark Levinson audio system with DVD player, DAB tuner, Bluetooth and USB/Aux ports. Satellite Navigation and on-board entertainment information is presented on a huge 12.3-inch central display. The best part of owning a Lexus is that you can be almost certain that nothing will go wrong. Even if such a thing ever happened, so efficient and pleasant are the dealers that you'll be almost glad it did. All of which will compensate you a little for running costs that may require a pause for thought. To maximise your returns, you'll need to make frequent use of the 'Eco' setting in the Drive Mode Select system. This reduces throttle response and engine power output in relation to use of the accelerator pedal to maximise fuel efficiency at the same time as limiting the voltage of the power control unit. So worthy efforts have been made. But ultimately, you don't buy a huge V8 petrol-powered luxury saloon like this and expect it to be an inexpensive thing to keep on the road. The LS460 returns 26.4mpg on the combined cycle and 249g/km of CO2 - significantly less than you'd get from more efficient direct rivals like BMW's 740i, Audi's A8 3.0 TFSI and Jaguar's XJ 3.0 S/C, but then it would be: these competitors after all use V6 rather than V8 power. You get what you pay for. What else? Insurance is group 48 for the LS460 Luxury model. Residuals meanwhile, are par for the class, with the figures kept buoyant by the fact that just 5000 LSs a year are produced for worldwide sale. On the face of it, introducing a big petrol-engined saloon car to revive your hopes seems a terrible idea, an act of sheer desperation. But Lexus is a company that's nothing if not piercingly self aware. It knows that in this market, it remains a niche player and that selling maybe 300 cars a year is a decent result when you don't have a diesel engine to bring to bear. The fifth generation LS460 is a car that's immensely likeable and if you can get to grips with the complexity of its systems, it's one that's rewarding to use on a daily basis. 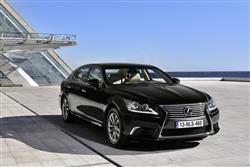 As for which LS460 to choose, well conquest buyers will certainly be direct towards the more dynamic F Sport variant. Typical LS folk though, will be more comfortable with the slightly more affordable 'Luxury' version we've been looking at here. It's everything you need from a car of this type. And everything you need a Lexus to be.